An individually owned home is more spacious and more private than a hotel or motel room. You will have the entire home, including a fully-equipped kitchen and often more than one bath, at your disposal. You will not have, of course, room service or valet parking. But you can often arrange for daily maid service if you would like it. Just ask the reservation coordinator. In comparing cost, you will likely find that the cost per bedroom to rent a vacation home is significantly less than the same number of hotel rooms. Be as detailed as possible in telling the reservation coordinator what type home will meet your needs. Let that person know what style home you prefer (contemporary, with modern furniture and fixtures, or a mountain cabin with stone fireplace and rustic furnishings, for example). Also, telling the reservation coordinator what you don�t want is a help (�I really don�t like a rustic cabin � I want to be pampered� or �It doesn�t have to be modern � rustic is fine�). Ask if there are written descriptions or photos available. You may also arrange to view properties that are available to see if they really would suit your parties needs. At Idyllwild Vacation Rentals, you need only arrive with your personal items and your groceries. All of our properties come complete with bed and bath linen and soap and paper products. For others companies, you may need to bring your own bed linens and cleaning supplies. Be sure to see what is included by referring to �Terms & Conditions�. There are two options for you to choose from to cover yourself from accidental or unintentional damage. 1)The Accidental Rental Damage Insurance - which, for a small fee, insures you, your family or your guests up to $1500.00 against any unwillful, unintentional or accidental damage or loss. Your second option is 2)The standard security deposit which is held pending any damage or loss following your departure. The security deposit ranges from $300 to $500 or more depending on the property. A refund of your security deposit normally takes up to 6 weeks. The home you reserve is prepared especially for you prior to your arrival which includes turning on the electricity and water, setting the thermostat according to the weather, and numerous other duties are performed for your arrival. Telephones are provided in most homes and local calls may be made at no charge. However, all long distance calls will require a telephone calling card or credit card. Most vacation homes are equipped with the standard cable service for the area. Homes where cable is not available are listed in the description for that home.Please make sure to let your reservationist know if cable, internet and telephone services are important to you. We want you to enjoy your visit to Idyllwild right up to the last minute. So, we only request that you leave the home in reasonable condition by bagging your trash and leaving things in a reasonably orderly manner. Leave the basic cleaning to our housekeepers�it is included in your booking fee. However, excessive cleaning or damage may be charged to your security deposit or security deposit protector plan. Like most resort areas, Idyllwild has its high and low seasons. High season occurs during mid summer and most holidays. The best rates are obtained during the low season�normally spring and fall. Watch for the specials and get one night free during low season! Take notes about the available vacation rentals you discuss so you don�t have to ask the Reservation Coordinator to repeat them. Know the number of people and the sleeping arrangements and the dates of your arrival and departure. Try calling mid week or mid morning or mid afternoon. The telephones are less busy during those times so you are likely to get the most attention and be able to discuss all aspects of your vacation in more detail. Yes, although it may be difficult during high season, don�t ever hesitate to call at the last minute�there just may be a cancellation. Always ask! If you plan to arrive after office hours, please call the office ahead of time to make special arrangements for pick up of your packet and pertinent information. We highly encourage you to arrive early enough (before dark) so that your cabin can be easily located. However, we understand individual circumstances and will do our best to accommodate your needs. Yes, all our homes are non-smoking. Pets are allowed on selected homes. If you are bringing your pet with you please contact our office so our staff can assist you in selecting a pet friendly home. "What do we need to do at check out time?" We just ask that you lock up the home and return the key to our office. "If I have a problem with the home what do I do?" We are always here to insure you have a wonderful stay with us. We have a 24- hour emergency number to call us in the very rare event you need us right away. 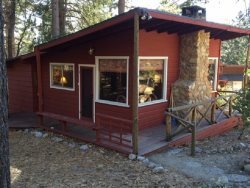 This is why more and more people are choosing to stay in a vacation rental home while in Idyllwild. They have the privacy and luxury of a home with the service and amenities of a resort.